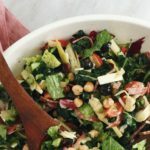 This Italian Chopped Kale Salad combines kale, radicchio, and romaine with all of the delicious goodies typical of an Italian chopped salad and a tangy Lemon Oregano Vinaigrette. Combine all ingredients in a mason jar and shake vigorously until combined and emulsified. Wash the romaine leaves, radicchio, and kale. Stem the kale and chop all of the lettuce into equal bite-sized pieces. Slice or chop all of the ingredients according to the above instructions. Toss and combine all of the salad ingredients with the dressing until thoroughly mixed. You can use as much dressing to your taste. I used 3/4 of the dressing, but you may need all of it depending on how large your kale and romaine bunches were. Garnish the salad bowls with freshly-cracked pepper and oregano. Store any leftover dressing (if you have any) in the refrigerator for up to 5 days.